Mark Twain apparently never said that the coldest winter he ever spent was a summer in San Francisco. However, the sentiment nonetheless rings true. 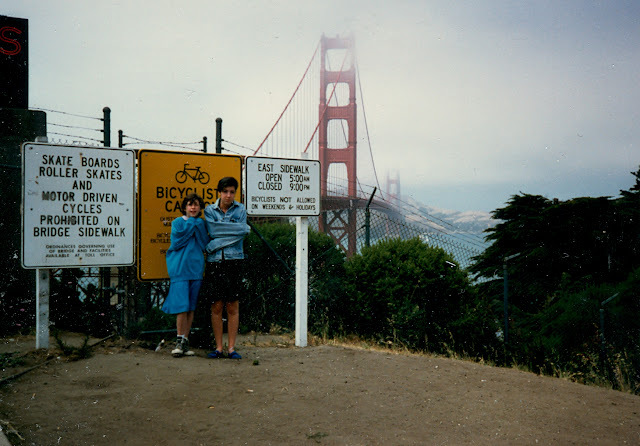 This photo, taken more than twenty years ago, shows my daughter's enjoying a pleasant summer's day by the Golden Gate Bridge. Walking on the Golden Gate Bridge, I often see dense clouds sitting just outside the Golden Gate while the sun is shining in the Bay. After the 1989 Loma Prieta earthquake, I volunteered to work on the repairs of the Bay Bridge (in late October). I spent a month on the bridge, but I could never get warm, despite having grown up in Michigan. California's Bridges: Golden Gate Bridge in San Francisco Bay (3) by Mark Yashinsky is licensed under a Creative Commons Attribution-NonCommercial-NoDerivs 3.0 Unported License.